The potable water system on our Defever is made up of copper water lines and flare fittings. I need to transition from a 1/2” male flare fitting to 1/2” NPT, preferably male. The only way I can see to do this is with a female swivel nut followed by a male flare-to-NPT adapter. Is there not a more direct adapter that would work? Something that would go directly from male flare to male NPT? The potable water system on our Defever is made up of copper water lines and flare fittings. My boat has the same style of potable water plumbing as yours. I replaced the lavatory faucet last weekend and ran into exactly the same situation. Although it might seem like an incompatibility, and it might only work by coincidence rather than by design, the 1/2" FIP connects to 1/2" flare for water (not for any type of gas). The threads are the same size. But, unlike flare-to-flare, and akin to other pipe thread fittings, it takes teflon tape or another thread sealant, for a seal. I saw that fitting on Amazon and almost waited to order one and get it delivered. But, when I looked, the home depot fittings I used were described as NSF/ANSI 61 listed for potable water, but that one on Amazon, although described as lead-free, was also described as not usable for potable water. I know nothing about such things and suspect it is just a matter of not having been tested and registered for compliance vs actually leaching toxic things. But, both for reasons of "available now" and for reasons of "explicitly listed as safe" vs "explicitly listed as don't do it", I went with the fittings from home depot. Jeez, talk about (me) staring past the obvious! I really titled this thread correctly. fractalphreak, thank you! Exactly what I need for the cold water line. An easy swap out for the tee already there. gkesden, I’m going to try your method on the hot water line—male flare into female MIP, well-taped and doped. (There is no tee on this line, just a male flare.) I dry-fitted them the way you suggest before and it seemed a little loose, until fully snugged down. Fingers crossed. You can also cut the flare off the end of the copper and solder the fitting of your choice on. Or cut off the flare and just use those push to lock fittings and plastic tubing. In my system, when I have to add or replace a water line I replace it with Pex tubing and Shark Bite connections. My apologies, i didnt read down through those details! Yep would want to get one rated for potable. Kinda scares me because buying brass at local stores never has that sort of info! Pex is a good idea, for this first year it wasnt in the cards as a larger project. Just to close the loop, this is what I settled on to replace an all-flare tee. Three female NPT ports that can accept flare or NPT male adapters. And it’s lead-free for potable water. Not cheap, but . . . ya gotta do sometimes. I've seen a few references to PEX in this thread. I am a huge fan. I've used a ton of it. In the past, I haven't used SharkBites in favor of less expensive and more permanent connections, except as temporary and reusable solutions while working. But, in a situation like this, I'd be willing to use SharkBites -- it can't sink the boat. But, do SharkBites work with copper tubing? Or just copper pipe? I've never tried them on tubing and I don't think it is listed as an option on their product descriptions (But, I could have just missed it). Has anyone used it on tubing? Success? Troubles? I presume that by copper "pipe" you're referring to hard temper copper tubing. Copper tubing is either hard tempered or soft annealed. 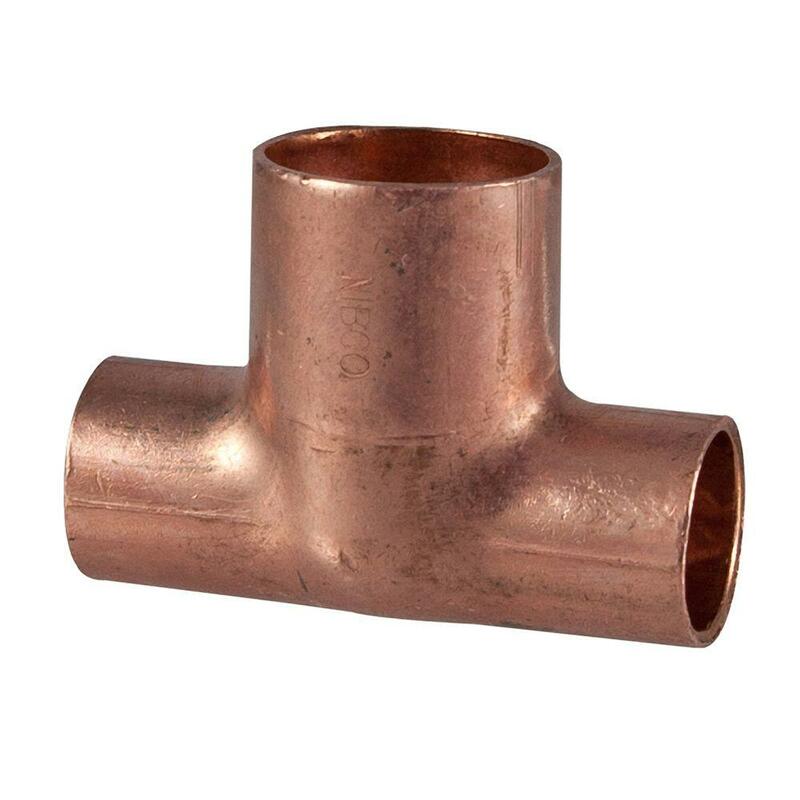 1/2" nominal copper tube can come in hard, soft, "M", "L", or "K" wall thickness. K soft copper is used for underground service, it has the thickest wall, and it's the most costly. The stuff you buy at the box stores is probably "M". If you're using tubing on your boat, regardless if it's hard or soft, it should be "L" tubing. M has red trace/lettering, L is blue, K is green. It's always referred to by its nominal size, but the OD is standardized for fitting selection. 1/2" nominal tube is 5/8 OD. 3/4" nom is 7/8 OD, etc. The tube and fittings are always called by their nominal size. In the trade, M is used for hydronic service, L for potable water, K is potable underground and sometimes specified for medical oxygen lines. Refrigeration tubing is referred to by its OD, so 5/8" refrigeration tubing is the same as 1/2 nom water line tube. Refrigeration tubing is generally cleaner inside, purged with nitrogen and capped to prevent oxidation of the ID wall. Available both hard temper "sticks" or rolls of tubing. A roll of refrigeration tubing is typically 50 ft, plumbing tube is 60. A standard stick of hard copper is 20 ft. Refrigeration tubing and fittings are called by its OD. If you're working on refrigeration, you'll ask for a 5/8 ell, if you're plumbing, ask for a 1/2" ell. Same fitting. Flare fittings are called by their OD. If you're working on 1/2" nom water lines and you need a flare fitting, you'll ask for a 5/8" whatever. Yup. That's how it works. Plumbing nomenclature is a language unto itself. Hard tube can be made soft for forming bends and offsets by heating it to red, then allowing it to cool (annealing). Hard tube can also be bent with a bending shoe, although it can wrinkle on the inside radius if it's poor quality. Flares can split if formed on hard tube without annealing first. And, yes, sharkbite fittings will fit on soft tube of the correct size. Make sure it's not dinged or misshapen. I'd still probably avoid it, if it's moved or bent it could initiate a leak. Flares aren't hard to do with a good flaring tool and good technique. You'll ask for a sharkbite in nom. If you ask for a tee, tee's are always named with the largest size, then the straight thru size, the outlet last. Here's a 1/2 1/2 3/4 copper ("bullhead") tee. "Fitting" or street or service- indicates the dimension fits into another fitting, e.g. it's the same size as the OD of the tubing. A street ell or S90 has one side that fits over the tube, the "S" part fits into another fitting. Bet that's a whole lot more than you wanted to know about copper tubing! BTW, it's not called pipe in the trade. Pipe has threads. Thanks so much! That was great info -- and I loved reading it. Thanks again! I do know it isn't called pipe in the trades. Done a lot of plumbing alongside plumbers. I just didn't want to bury my own question in detail for someone outside of the trades who could have answered based upon experience boating. I think I'd have lost a lot of people asking about their experience with ductile vs rigid tubing and across various wall thickness types! But, again, thanks so very much. That was exactly the answer I wanted! And, I learned a lot. "In my system, when I have to add or replace a water line I replace it with Pex tubing and Shark Bite connections." Depending on how long the water sits in the system , copper might be a more healthy choice? I have 3/4" copper lines on ASD. The PO had used clamps and plastic hose when installing a hot water unit. Well the plastic hose slipped off and I had water everywhere. I found 3/4" sharkbite fitting worked great and I have used PEX and sharkbite fittings ever since. 1970 Chris Craft, all copper tubing for potable water. Shark bites work well. I needed to run new supply lines from the aft vanity (lower deck) to the new galley faucet set up in the saloon. The PEX is SO much easier to work with than copper.